The group attended with Guys Cuttings and like the other Exhibitors and Traders were set up at the end of the main shed which leads out onto the platform. The show was due to open at 10:00 on the Saturday morning and as exhibitors we had access to the building from 08:00, so this gave us a reasonable 2 hour setup time. This was more than enough and within an hour we had our first trains running on the layout. 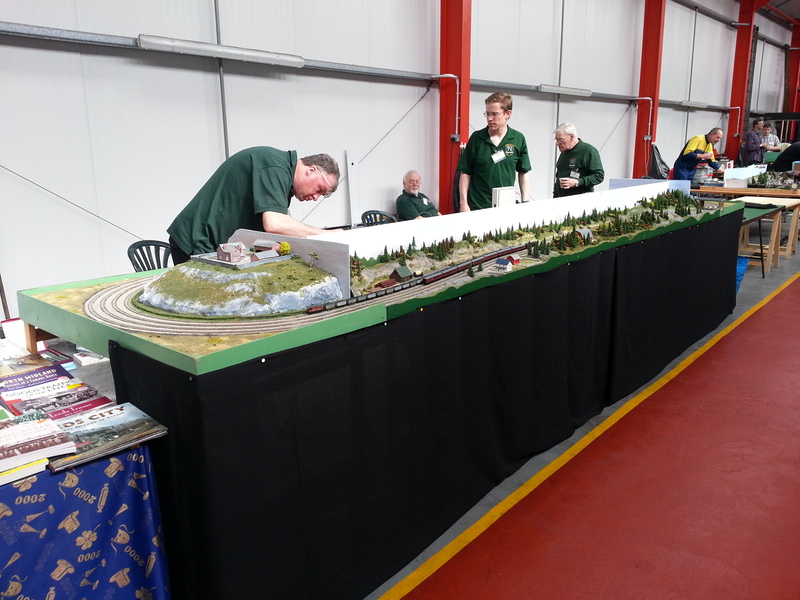 I have to praise all those involved in setting up as the layout ran faultlessly throughout the whole weekend. There was a steady stream of visitors throughout both days and a genuine interest in our layout, particularly the fact that in our chosen scale it's possible to run full length trains. I have to say a big thank you to all of the Staff at Middleton Railway as they looked after us superbly over the weekend and really made us feel part of the team. But by far the best part of the weekend was that as a treat for the Exhibitors and Traders, Middleton Railway kindly provided each of us with the chance to have a footplate ride on one of their locos, which was a fantastic experience.